I was very pleased to be asked to judge the woodturning for the Woodbury wood turners annual show in 2015. This has become a popular one day event and is well worth a visit. 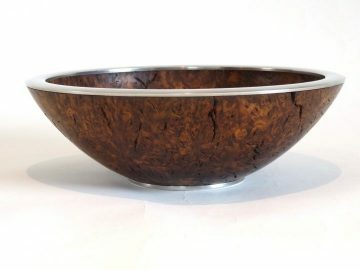 The work judged was outstanding but one that stood out for me was a bowl with a pewter rim and base. I knew the process but had never tried it and went home determined to have a go for myself. For practice I melted an old pewter mug in a pan over a small electric hob but since then have bought pewter ingots as these do not contain lead- an unhealthy additive. Dark wood appears to look best against the pewter but I have also used ash which I have ebonised. Attach your blank to the lathe and turn the outside shape with a sacrificial spigot. Work out the size of the foot you are going to have and turn a flat with a tongue to accept a pewter ring with a groove in it later. Next turn the bowl around and hold it in your chuck on the spigot. Start to turn out the inside of the bowl but only enough to identify the rim. Make sure the rim is flat but with a tongue in the middle. Make a chucking point in the middle of inside of the bowl so that you can turn it around yet again. Remove it from the lathe. Knowing the size of the rim and base you can now take a flat disc of MDF or plywood and cut recesses with a parting tool the size and diameter you want to take the molten pewter. Straight sides in the recess appear to be best. You may well have to remount the disc a number of times on the lathe so have a good chucking point. Heat & pour the pewter. Wear gloves & eye protection at all times. When solidified & cooled the disc can be remounted on the lathe and the pewter turned flat with a bowl or spindle gouges. Put a groove in the pewter with a parting tool to match the tongue on the bowl. When you are satisfied you can cut away the wood on the inside edge of the mould to release the discs. So far I have glued them on with medium super glue or epoxy two part adhesive. After it has cured I can mount the bowl from either end to finish as normal.